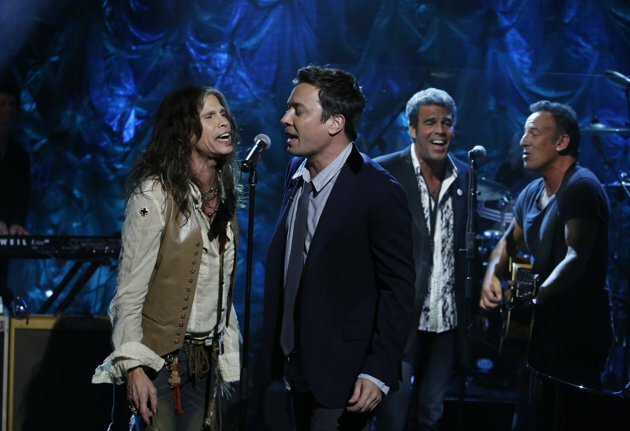 From “Livin’ on a Prayer” to “The Living Proof,” every song Friday at NBC’s benefit concert for superstorm Sandy victims became a message song. New Jersey’s Jon Bon Jovi gave extra meaning to “Who Says You Can’t Go Home.” Billy Joel worked in a reference to Staten Island, the decimated New York City borough. The hourlong event, hosted by Matt Lauer, was heavy on stars and lyrics identified with New Jersey and the New York metropolitan area, which took the brunt of this week’s deadly storm. The telethon was a mix of music, storm footage and calls for donations from Jon Stewart, Tina Fey, Whoopi Goldberg and others. The stable of NBC Universal networks, including USA, CNBC, MSNBC, E! Entertainment, The Weather Channel and Bravo, aired the concert live from the NBC studios in Rockefeller Center in midtown Manhattan, several blocks north of where the city went days without power. Millions of people for whom the benefit was organized couldn’t watch the event because they had no electricity. NBC Universal invited other networks to televise the event, but not everyone signed on. That might have something to do with network rivalries. In the wake of the Sept. 11 terrorist attacks, the networks organized a benefit together behind the scenes and it was televised on more than 30 networks simultaneously, including all the big broadcasters. After Hurricane Katrina, NBC televised its own benefit before the other broadcasters, one that became best known for Kanye West’s off-script declaration that “George Bush doesn’t care about black people.” The other broadcasters cooperated on their own telethon a week later, and NBC televised that one, too. Also this year, NBC organized and scheduled a telethon and gave others the chance to air it. Others declined to televise Friday’s telethon, even though ABC parent Walt Disney Co. said it would donate $2 million to the American Red Cross and various ABC shows will promote a “Day of Giving” on Monday. The CBS Corp., Viacom Inc., parent of “Jersey Shore” network MTV, Fox network owner News Corp. also announced big donations to the Red Cross.